Mention the words ‘Kurri Kurri’ to many New South Welsh car nuts and chances are you’ll be presented with a big grin. That’s because this classic Aussie almost-rural town, 40 minutes from Newcastle boasts one of the snappiest little car shows goin’ round! 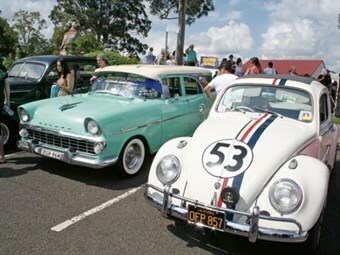 The car show is part of the annual Kurri Kurri Nostalgia Festival. Now in its second decade, this terrific event is held at the end of March when the Newcastle region’s weather is on its best behaviour. The Festival boasts three days’ activities inspired by the polka-dotted, baby-boomer, rock ‘n roll era but the pinnacle is Sunday’s car show that accepts just about anything with chrome bumpers – classic Australian, Pomgolian, American and Japanese cars, plus an interesting scattering of street machines, rods and bikes; there was even a number of classic trucks! It keeps growing, too. Held in the closed-off Kurri town centre, the volunteer State Emergency Service crew had to direct plenty of classics into side-street parking once Kurri was full, despite the extra street space allocated for the display this year. If you manage to see all the cars at the event, you’re doing well. Thankfully, there are some grand old pubs in Kurri so there are plenty of chilled refreshments available. And to be honest, more towns need more events such as this: Kurri is an Aussie town, like many others, whose heart has been broken by the decline in Australian farming, mining and manufacturing. Events such as the Kurri Kurri Nostalgia Festival do a lot to keep motel beds full and bar staff serving top-value steak, chips and salads along with icy cold beers to happy customers.